The new RYDEEN drum set is exactly what any beginning or intermediate player needs. 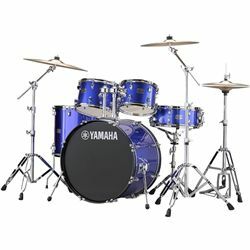 With shells made from poplar wood, this drum set utilizes genuine Yamaha hardware and features either solid or glitter finishes, each with three color options, for a total of six vibrant, stylish looks. Also included are two 22.2 mm diameter Genuine Yamaha tom and pipe clamps. A versatile ball mount gives you the freedom to mount toms at any angle you want, and lets you incorporate other hardware to create a configuration that’s perfect for you.